Pillows complete the look of any bed and layering pillows of different shapes, sizes, colors, patterns or textures creates a unique look. Enjoying both a unique look and one that looks LUX I enlisted an expert in my life to help create my look. My mother in law. She is an expert seamstress and together we set out to design a subdued, calm look for my bedroom. My bed being the focal point of my room it was important to embellish it with pillows that set the tone I wanted. Elegant, LUX and calming. 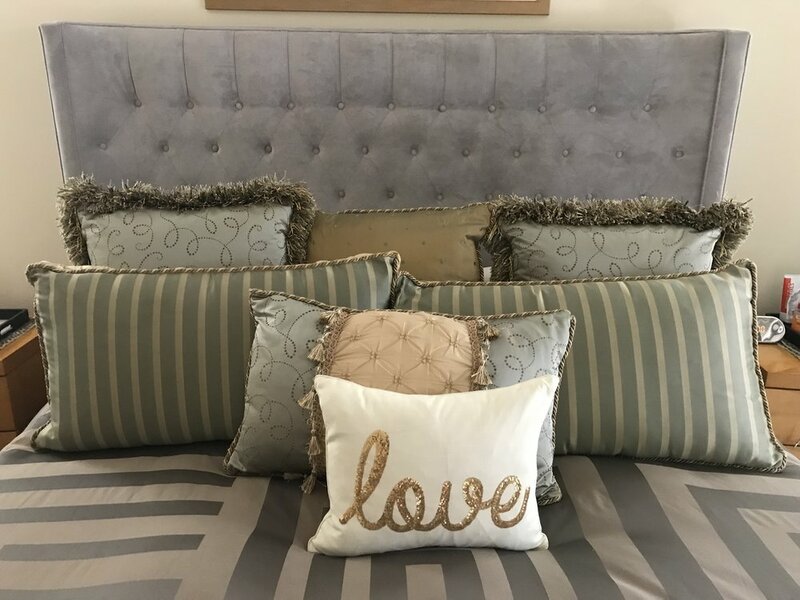 We picked silk in (grayish green and dark gold) which is the main material for all the pillows and a tufted satin (gold fabric) on fringed pillow which is also the backing for 2 rectangular pillows. Finish on them is chording, fringe and tassels. Pillows themselves were old recycled pillows we had from before, re-covered with higher end fabric. Ikea, Costco and discount stores like Ross or TJMaxx are good options if you need to buy new pillows you want to cover. Love accent was a valentine Bunco gift prize and one that I change out with others for either a color or season accent. Bed is likely the focal point of your room. Elevate your bedding with pillows and use an accent like love to rotate and change your theme. Elevate the bedding by adding pillows of different shapes, textures and color. Simple bedding and pillow collage match the picture wall collage and complete the simple look for a small size goest room. 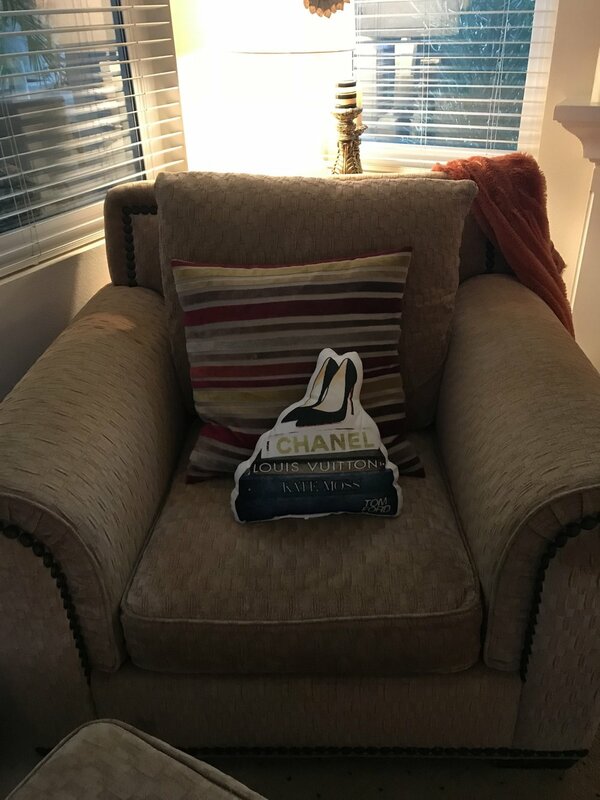 Bunny pillow as a holiday accent and easy to rotate for seasonal look. My oversized living room chair fro which most of my post originate. Adorned with what I love most, shoes. Well close a shoe pillow. Decor can be fun too. In my guest room it is all store bought with specific focus on un-matched items that look good together, This is a Day bed, in a brighter lit room with a simple cotton light gray polka dot duvet cover. 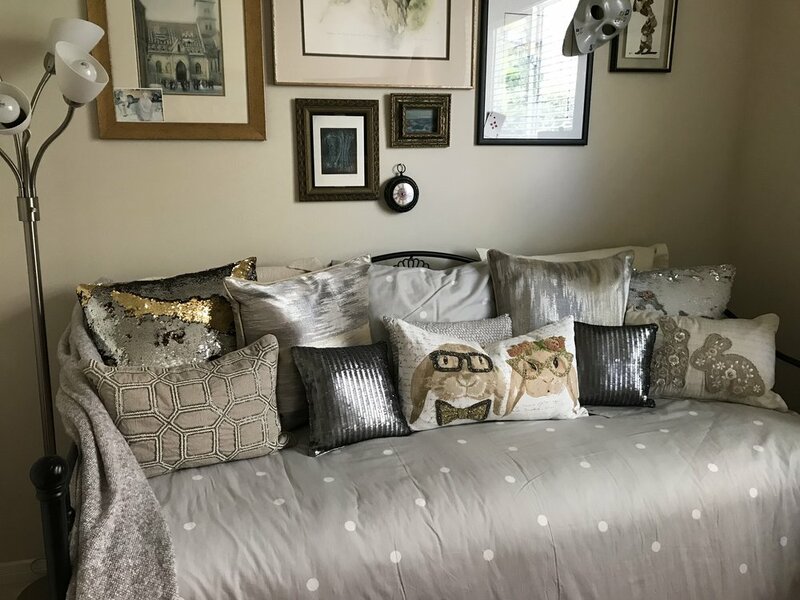 Sticking with a neutral pallet of gray, white, cream, silver and gold I wanted to make a collage like pillow spread to mimic my wall picture collage design. I love this look and it is all from TJMAxx, Target and Bed Bath and Beyond. Accent pillow here is the bunny ready for Easter and one I rotate as well. My advice to anyone is this. Buy cute pillows when you see them. Take them home to see how they work, and if they don't ,return them. It takes me a while to find the right ones that I feel I want to keep for my couch especially, and I usually go through 3 or 4 return trips before finding keepers. If you have a heavy duty sewing machine and know what you are doing, go it alone and design the look the way you want it. Either way don't be afraid to mix texture, color, shapes and try different stuff. Pillows are one of the simplest and least expensive items that can immediately change the look of any room. Get your pillow game on! Be Awesome and Sparkle. How my husband gets extra loving?